A personal interview with Jurgen Hecker on the 4th floor of Combes. Image Credit: Malick Rupert. Keeping up with the many passions of AUP's video journalism professor. Where does Jurgen Hecker find the time? In early October, the Jules Ladoumegue sports center in north-east Paris is refuge for Parisians trying to play sports in the waning summer sun. As the golden wave of sunset creeps below the horizon, shouts from soccer and basketball games echo through the empty bleachers. The light reeling sound of a bicycle chain echoes from the ramp below. A tall, slender, silver haired man slowly rises over the horizon. The expression on his face is one of focus. His pointed features and sharp eyes pierce forward as he cycles on his way to a weekly tennis match. As he gets closer, his sharp eyes and pointed features break into a warm, soft smile. It's a smile familiar to his students at the American University of Paris where he teaches video journalism. After dismounting from his bike, Jurgen Hecker greets me with a firm handshake while holding his smile. While camera equipment is being set up, he cracks open a fresh can of tennis balls. Having just had his racket restrung, Hecker takes to the court and serves tennis balls from one side, then retrieves them to serve from the opposite side, repeating this ritual. “I sometimes think happiness is a sunny day and a tennis court,” he says. Chatting while waiting for his tennis partner to arrive, it quickly becomes clear that Hecker is a man of many passions. “I do theater, acting, pilates, yoga, cycling, play tennis with some friends, write a little bit, creative writing, and sometimes I host round table talks,” he says. He recalls Hannah Arendt’s book, The Human Condition, in which Arendt contrasts two modes of life: Vita Activa versus Vita Contemplativa. Active life versus contemplative life. “I think I’m currently in an active phase,” he says with a chuckle. This may explain why Hecker rarely lingers on the AUP campus following his video production classes. Aside from AUP, he teaches at Science Po and is a journalist at Agence French Presse in Paris, often cycling between his offices. Outside of professional journalism and teaching, Hecker spends much of his time pursuing his hobbies. “Happiness and feeling good also comes with physical exercise. You exert yourself, you cycle, you run, you take care [and] you don’t eat too much crap. And all that means you hopefully enjoy life more, and hopefully longer,” he says. With the remaining time in his week, he attends his band rehearsals where he plays bass and still finds time for himself to pursue creative writing. “I’m not doing it out of some sense of masochism, I really love all of these things,” he says. 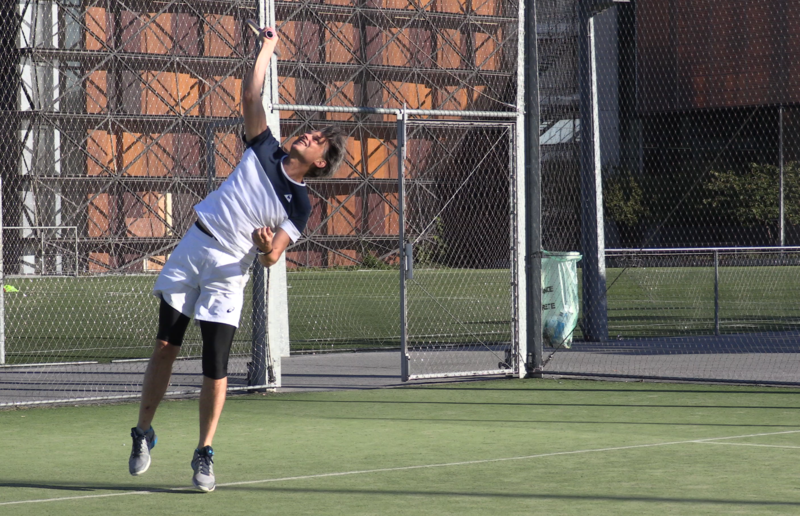 Jurgen Hecker warming up for his tennis match. Image Credit: Malick Rupert. As Patrick recounts, Hecker’s aggressive approach to tennis is reflective of his overall approach to life: to seize the time one has. Whether its work, teaching, acting, tennis, pilates or yoga Hecker constantly fills his time with his passions, leaving myself wondering: How does he find the time? Abiding by a strict schedule, Hecker finds time by cutting time from non-essentials.“The only way to manage it is: You have to stop sweating the small stuff,” he says. For Hecker that means leaving minor bills unpaid for weeks, occasionally missing the hairdresser and sometimes not grocery shopping for weeks. “I don’t go out mid-week. I try to go to bed at a reasonable time. I watch much less Netflix and Prime video than I’d like too,” he says. Hecker’s easy-going, charming persona conceals a man with disciplined intensity to explore life from his earliest childhood. He was born in Dublin and was raised in an Irish-German home, hence his Germanic name and Irish accent. “My mother was a rebellious, wild Irish beauty,” he recalls proudly. As was common in those days, Hecker’s mother, Joan, was a homemaker taking care of Jurgen and his three sisters. “She did the best she could, and she handed down a lot of really good things, the charm, a sense of humor, the ability to bend rules, the lightness of being,” Hecker recalls. Hecker describes his father as being stricter and more intense, much of which Hecker attributes to his father’s harder life experiences. During World War II, Hans Hecker served in the German navy, eventually being captured and being sent to American prisoner of war camps in the United States. After the war, he returned to a Cold War East Germany where he pursued his passion for music, formally studying music in Berlin. 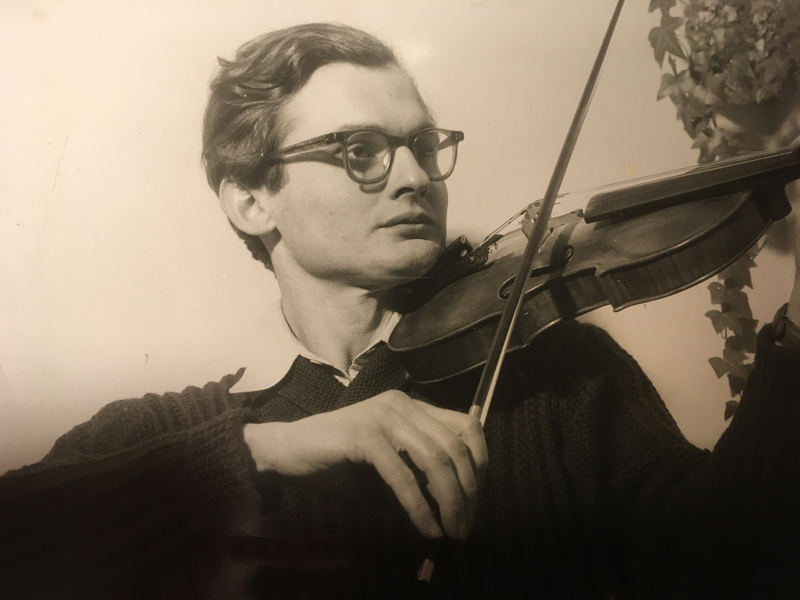 Jurgen Hecker's father, Hans Hecker, playing violin. Image Credit: Jurgen Hecker. Due to Ireland’s neutrality in World War II, Ireland was spared much of the economic ruin central Europe suffered during the war. Thus Ireland became a popular refuge for many war-torn Europe’s musicians, including Hecker’s father. Hans moved to Dublin, Ireland where he joined the Radio Éireann Symphony Orchestra as a violinist. Eventually meeting Jurgen’s mother and starting their family in Dublin. “The big legacy from my father is the music,” Hecker recalls. Singing in choirs, playing piano, learning music theory and playing in competitions, Hecker was driven into the music world by his father. Whether it was youthful rebellion or a reflection of his mother’s rebelliousness, Hecker felt forced into music and struggled to enjoy it thoroughly. Despite the conflicts, Hecker played music until he was about 11, after his father passed away at the age of 49. “After he died, I dropped everything. I dropped music completely. The pressure was gone and I didn’t play the piano again for about four years,” he says. This four-year hiatus came to an end after hearing his high school music teacher’s rendition of Mussorgsky’s “Pictures at an Exhibition.” Having always liked the piece and moved by the beautiful rendition, Hecker was re-inspired to pursue music, more passionately and deeper than before. After years of piano classes, playing with friends and concerts at school, Hecker was on the way to being a future concert pianist. However, working for his local newspaper at the time, Hecker also felt a draw of excitement to journalism and at 18 years old, Hecker was faced with a decision. Either to attend conservatory to pursue music or go to university to pursue journalism. “I knew that a pianist’s existence is lonely," he says. "They spend eight hours per day, alone with [their] instrument to get perfection. Whereas I had this idea that journalists, they travel and have all these languages, and meet all these women, and it’s all very glamorous." Hecker chose to pursue journalism. Leading him to study political science and philosophy in Germany. However, after wanting a change of scenery, Hecker decided he wanted to study in an anglophone country. With California being too expensive and Dublin being too close to home, he settled for London and eventually got accepted to the London School of Economics. “I realized in some kind of flash of inspiration. I guess, that if I didn’t understand money and how it motivates us, I was never gonna understand politics.” Hecker says. Eventually, he earned himself a Masters in Economics. His work schedule at Agence France Presse is anything but normal compared with average nine-to-five jobs. On a quiet Saturday afternoon, warm sunlight attempts to glow through the windows of the news floor, but the rays are washed out by dozens of fluorescent light panels, commonplace in any modern office. Scattered across the walls sit lockers, clocks and TV screens silently flashing the 24-hour news cycle over a symphony of chattering keyboards and clicking of cursors. “This is where it’s happening at Agence France Presse, we are at the heart of what is one of the three international global news agencies,” Hecker says. Agence France Presse (AFP), found in 1835 as Agence Havas is the world’s oldest news agency. AFP is one of the top three international news agencies in the world alongside the United Kingdom’s Reuters and Associated Press, in the U.S.
On a quiet Saturday afternoon, the journalism powerhouse that is AFP seems to be a sea of empty desks and blank computer screens with journalists scattered at islands of work. Hecker sits across from two of his co-workers, separated by four glowing computer screens, each covered in windows leading to twitter feeds, e-mails and live updates from Wall Street. It is from these four computer screens that Hecker serves as the Senior Economics Editor for AFP. Working with a small team of economics specialists, His desk receives copy from across all of AFP’s bureaus and is the final line of editing before AFP’s product reaches their readers. “I picked journalism over music, and after that never looked back," he says. "I was always going to be a journalist.” Since then, he has spent more than 30 years in journalism, working for multiple news outlets, and covering various beats in many different countries, eventually moving from field work to newsroom jobs behind a desk. 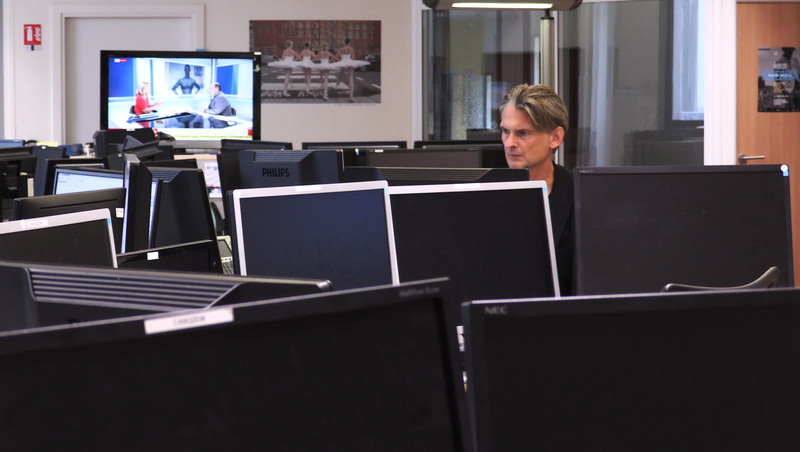 Jurgen Hecker works from four monitors on a Saturday afternoon at AFP. Image Credit: Malick Rupert. After graduating from the London School of Economics, Hecker joined the BBC World Service in London as a radio correspondent and news reader, taking his first step into professional journalism. Less than a year later, after Hecker met his future wife and mother of his children, they moved to Bolivia where he learned Spanish and worked for both the BBC and a small German radio station, Deutsche Fernsehagentur. Traveling around South America, Hecker covered the tail end of the Pinochet regime in Chile, various elections on the politically unstable continent, as well as drug trafficking between Bolivia, Colombia and Miami. In South America, Hecker found the excitement he sought in journalism, even if it was sometimes dangerous. After Bolivia and a brief time as a radio correspondent in Paris, he was assigned to Berlin in November of 1989 in anticipation for the fall of the Berlin Wall. “That’s when journalism became seriously interesting,” he recalls. Despite working seven days a week, 16 hours a day while skipping meals and smoking two packs a day to cope with the stress, the fall of the Berlin Wall was the ultimate journalistic experience. “Having an Irish passport, I went in and out of Checkpoint Charlie, which was the stuff of spy novels. I never thought I would ever get near that place,” he says. Given fast cars and free reign to go in and out of East Germany, Hecker’s young team covered various stories from hospitals abandoned by doctors to orphans who were left behind. “I knew, and journalists don’t always do, but I knew that I was witnessing history in the making. It was so bloody obvious. There’s no way you could miss that. You would remember those months between November ‘89 and the Spring of 1990 forever,” Hecker recalls. After the fall of the Berlin wall, and a brief time with Reuters, Hecker eventually returned to Paris and joined AFP, where he has continued to work for 27 years. 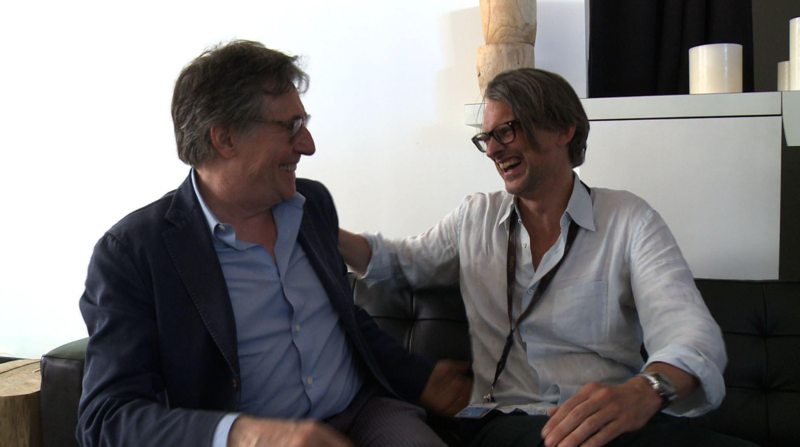 Hecker shares a laugh during an interview with Irish actor, Gabriel Byrne. Image Credit: Jurgen Hecker. Throughout his time with AFP, Hecker has worked as a correspondent and editor for a range of topics from business and economics to culture as well as Nordic Bureau Chief in Stockholm, Sweden covering all topics in Scandinavia. Over the years, Hecker has taken a step away from journalism. “It’s actually really hard to combine a fully fledged journalistic career with things such as a family. I have found that whenever I was having my most intense journalistic moments, I wasn’t having much of a life outside of that. Friends, love, none of it was basically happening,” Hecker says. Now as a more seasoned journalist, Hecker has replaced his long days of chasing stories with copy editing and pursuing other interests in his life. “I think something important happened. My dad died when he was just shy of 50... And when I got to be the age he died at, all the time since has been a bonus, compared to what he couldn’t live,” Hecker says. When Hecker reached 49, his father's age when he died, Hecker was reminded of his mortality and was inspired to focus on what was important in his life. After years of interviewing actors like John Travolta and Cate Blanchett, Hecker began taking acting classes of his own. It is this realization that made Hecker’s life shift into what philosopher Hannah Arendt would call Vita Activa. For Arendt, Vita Activa maintain two central features: freedom and plurality. Both of which Hecker enjoys freely in his life. “As I get older, I care less about what people think, or about how I should be. I realize there’s a massive amount of freedom in getting older,” Hecker says. More curious and willing than ever, his interests have driven him to expand his range of abilities. “I think the ‘specialization’ that’s a hallmark of the 20th century, has gone too far. I think it’s good if [people] are good at one thing, that’s cool, but if that is at the expense of everything else in life’s experience, then one [specialization] probably is a little bit poor,” Hecker says. He has returned to pursuing music, not as a profession but as a passion. “There’s still a certain purity and romanticism [in music], because I’ve never had to play music for money, and never had to enter in any of the compromises that come with that,” he says. He now plays bass in a recently formed band made entirely of AFP Journalists, all of whom balance their journalistic career with their passion for music. Jurgen Hecker plays Bass with his band. Image Credit: Malick Rupert. 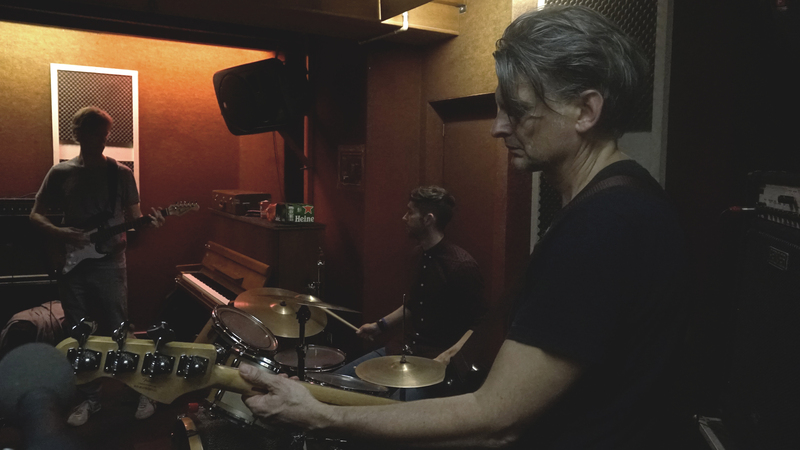 The band has not yet been able to decide upon a name, however, Hecker is determined to live this band to the fullest with hopes to have their first gig before the end of 2018. “Life to me is a gift, because [my father] only made it to 49 and three quarters, and I’m beyond that. It gives me a lot of energy to do so many things. You have no idea what’s coming down the pipeline and neither do I. But I’ve got plenty of stuff left to do." Hecker says.